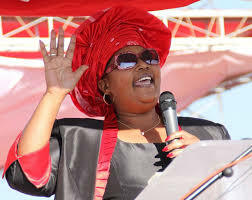 The Dr Thokozani Khupe led MDC-T says it has moved on and is not losing sleep over the faction led by Advocate Nelson Chamisa. Dr Khupe said they are done dealing with people who have no respect for the Constitution. Addressing just over a 100 party supporters in Luveve, Dr Khupe seemed to dismiss any chances of rejoining the Chamisa led faction insisting that they will go ahead to form the next government once elected into power. “Once we are elected into power we will ensure that there is free medication. Government should be responsible to teach people especially at primary education and parents should only start paying school fees at secondary education going upwards. We don’t tolerate violence and as such we have since moved on and we are ready to face whoever is standing in these elections,” she said. The MDC-T Khupe led faction national chairman, Mr Abednico Bhebhe admitted that it was a tall order to dislodge Zanu PF from power as the ruling party has proper structures especially in the rural areas. “Zanu PF is very clever when it comes to managing the elections. We have 57 rural district councils and only there are being controlled by the opposition and that explains why it is not easy to remove Zanu PF from power. We need to go to Zanu PF strongholds and fight there not to waste time in Bulawayo and Matabeleland region,” said Mr Bhebhe.